TALK CLEAN TO ME: I TRIPLE DOG DARE you to wash your hands! If you have seen A Christmas Story, you'll know the reference to "triple dog dare". For those that haven't, it is a movie of a boy who wants nothing but a Red Ryder BB Gun for Christmas. Set in winter in Indiana (think cold), the scene I am referring to has Ralphie's friends Flick and Schwartz arguing over whether a person's tongue will stick to a frozen flagpole. Schwartz ultimately issues Flick a "triple dog dare" and Flick's tongue gets stuck to the pole. Aside from the obvious grossness factor that flag poles are likely a breeding ground for who knows what human or animal pathogens and certainly NEVER cleaned and the thought of sticking my tongue on it makes me gag a bit, there is no obscure infection control subplot. It's all about the childhood concept of daring a friend to do something. To improve our HAI rates and patient safety outcomes we have implemented infection control bundles, we have implemented auditing programs for environmental cleaning and for hand hygiene and we implemented antibiotic stewardship programs. Yet we continue to see HAIs and I think many of us can give more than a dozen samples of healthcare workers not following best practices. Perhaps, it's time to change our tact - if you were DARED to do something by a friend or peer would that put enough pressure on you to do what's right? What if that DARE was said out loud in front of your other peers - what then? May 5th, is the global SAVE LIVES: Clean Your Hands campaign organized by the WHO. As of this April 24th, 15, 596 healthcare facilities from around the globe have registered to partake in this campaign. SAVE LIVES: Clean Your Hands campaign aims to galvanise action at the point of care to demonstrate that hand hygiene (HH) is the entrance door for reducing health care-associated infection and patient safety. It also aims to demonstrate the world's commitment to this priority area of health care. Washing ones hands is such a simple action. It is certainly one of the primary ways to reduce HAIs, yet worldwide the lack of compliance among healthcare workers (HCWs) is abhorrent. According to WHO, adherence to HH by HCWs ranges from 5% to 89% with the overall average being 38%! Further, the frequency with which HCWs cleaned their hands ranged from 5 to 42 times per shift. Assuming an 8 hr shift, my guess is the 5 time/shift hand cleaner washes before morning and afternoon break, before lunch and assuming they only use the toilet twice - they wash after relieving themselves. Sounds to me like that person cares about themselves and doesn't give 1 hoot about patient safety outcomes. The fact is following contact with patients and/or the contaminated environment, pathogens can survive on hands for between 2 and 60 minutes. Moreover, HCW's hands become more and more contaminated the longer the duration of patient care is. When HCWs fail to clean their hands during patient care or between patients (e.g. 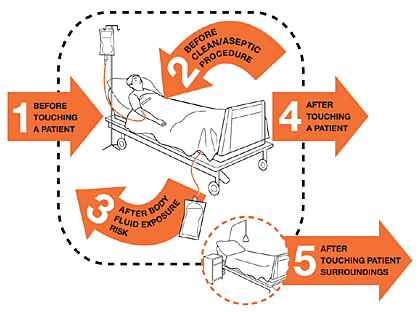 they do not follow the Five Moments of Hand Hygiene), the likelihood for pathogen transfer from HCW to patient increases. A study commissioned by the Joint Commission in 2008/2009, found that doctors and nurses fail to wash their hands with alarming frequency, contributing to the 247 deaths caused each day by preventable hospital infections. Healthcare facilities around the globe have tried to address the problem of low hand hygiene compliance rates through numerous techniques such as constant monitoring and auditing, programs that involve the patient to promote hand hygiene prior to patient care and installation of hand hygiene surveillance equipment (cameras and RFID systems). While compliance does improve, the long term sustainability varies. It's appalling to know that regardless of what program is implemented there are still HCWs who believe they are "above the law". Worse yet, is that their peers, their patients and in even in some cases, the C-Suite Executives are reluctant to call these people to task and point out to their faces their lack of compliance. It's funny, as children we had no issue with daring our friends to do something. We certainly had no qualms about shouting out for all to hear that "Johnnie just picked his nose! ", why as adults have we lost this ability? Stand up and call a spade, a spade! The next time you see a friend or loved one, a peer, a boss or a patient miss an opportunity to wash their hands, call them on it! Quite literally, the life of one of your loved ones could be in their hands some day! If you know they do not wash their hands when they should, do you want to take that risk? Come on, I TRIPLE DOG DARE you to!